Video: RockShox Product Manager Jeremiah Boobar talks about the new BoXXer DH fork. It seems suspension maker RockShox knows a good thing when they see it—or in this case feel it. The Charger Damper—the key ingredient in their acclaimed Pike all-mountain fork—has found its way into their new version of BoXXer, the company’s flagship dual-crown downhill fork. And should you have recently purchased a BoXXer, worry not—RockShox has made the Charger Damper, as well as the new version of its Solo Air spring cartridge, available as an aftermarket upgrade for existing BoXXers. It’s raining suspension options from RockShox as of late. The BoXXer is the latest to get a revamp. 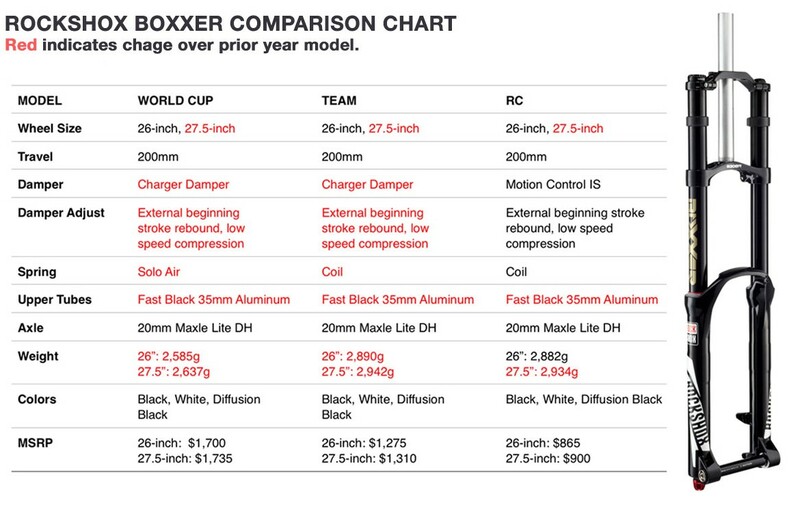 The new BoXXer comes in three versions—World Cup, Team and RC—and sports 200mm of travel. The $1,700 World Cup includes the Charger Damper and Solo Air spring, while the $1,275 Team version ships with the Charger and a coil spring. The $865 RC comes with a Motion Control IS damper and a coil spring. 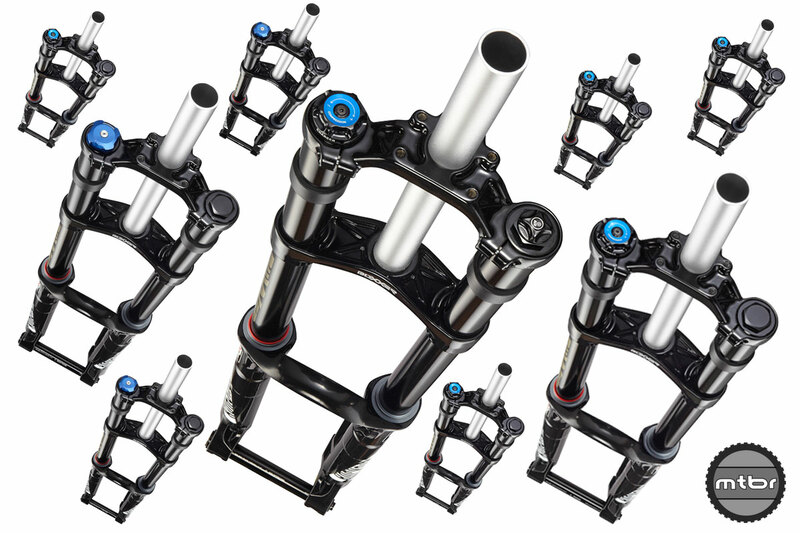 All three shocks feature Fast Black, Rock Shox’s friction-reducing stanchion coating, as well as Maxle Lite DH thru-axels. All are available in 27.5-inch wheel size versions for an extra $35. Like the shorter-travel version of the Charger Damper, the DH-specific variant purports to give the fork better consistency and small bump sensitivity resulting in a more supple feel and better traction. It’s also 100g lighter than the prior BoXXer damper, making it much sought after by world cup competitors—including world champ Stevie Smith—who rode prototypes of the system for part of the 2013 season. The Charger uses a single compression adjuster and a beginning stroke rebound adjuster with a factory set Rapid Recovery tune to dial-in its settings while internal shim stacks can be re-tuned for light or firm compression and rebound settings. 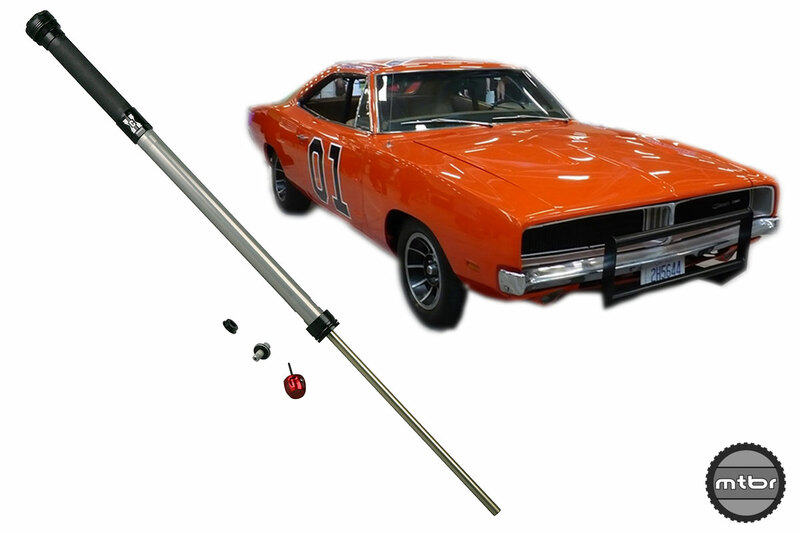 Putting a new Charger Damper in your old BoXXer is sort of like a Dukes of Hazzard suspension upgrade. RockShox has put more emphasis on the Charger Damper’s Rapid Recovery system on BoXXer than they did for Pike, though the tune exists on both. The idea behind it is to keep more travel available on successive hits by quickly cycling back up through the travel to avoid suspension pack-up. RockShox says the system maintains ride height for more available suspension, helps keep the wheel on the ground for better traction and decreases impacts to the rider. Video: RockShox Product Manager Jerimiah Boobar explains the new upgrade kits to keep older BoXXers on the cutting edge. RockShox has made the Charger Damper for BoXXer available as a $379 upgrade for 2010-14 model year forks that use a 35mm chassis—BoXXer Race, Team, RC, R2C2 and World Cup. Similarly, the new Solo Air spring with revised spring curve can be used in model year 2011-14 BoXXers with a serial number later than 16T11XXXXXXX. 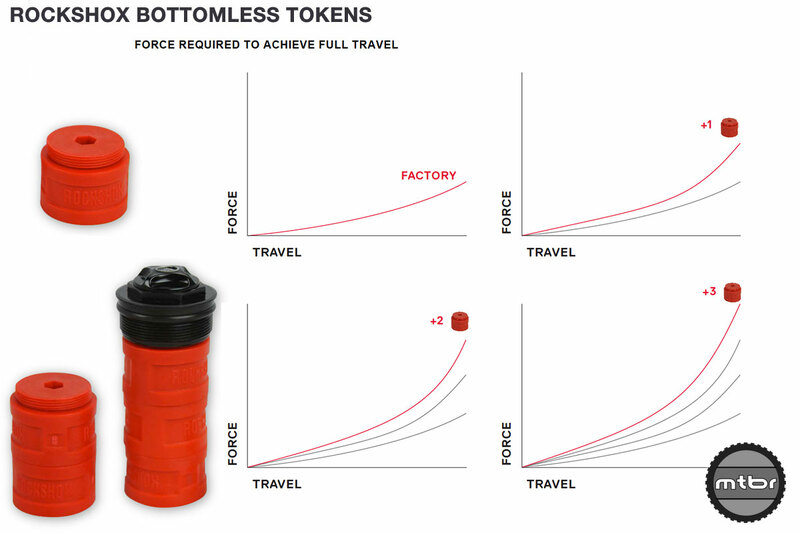 It’s compatible with the company’s Bottomless Token air volume adjustment system and costs $188. On both BoXXer and Pike, RockShox has made its Bottomless Tokens available as a means to adjust the spring rate in order to give the forks a “bottomless” feel, as the name suggests, by reducing the air volume. The tokens thread into the air spring top cap and allow adjustment for weight and riding style. Video: Though this video was made for the Pike, Bottomless Tokens work the same way for BoXXer forks. RockShox’s more value-minded Domain Dual Crown DH fork remains essentially unchanged, but the company has added a 27.5-inch wheel version of the fork to their lineup in both the RC and R versions. 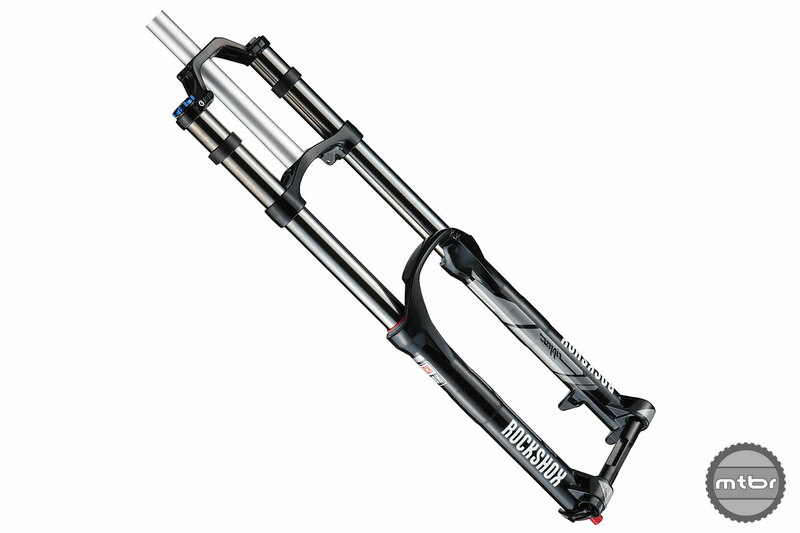 Both feature steel upper stanchions and coil springs packaged in RockShox’s 35mm tubes. The R is an OEM-only option, while the RC can be had as an aftermarket purchase for $733 as a 26-inch fork and $768 as a 27.5-incher. Though it lacks the BoXXer’s high-end features, the value-minded Domain Dual Crown is hard to beat on a punch-for-price basis. What is the greatest DH World Champ race run of all time? Why are these not inverted?